Apache Pivot is a modern framework to create rich clients as desktop applications or to run in a web browser. It offers nice GUI elements, supports XML/WTKX templates, data bindings, JVM scripting languages and much more. In the following short examples I’m going to create a desktop application to open a file browser, select a file and output the selected file’s name, first using a programmatic approach to create the user interface, and afterwards using XML/WTKX templates. When charts are needed we might want to add pivot-charts in addition to the other dependencies. In the first example we’re creating the application as if we were using swing .. creating elements and adding child components to their parent container in a programmatic style. Running the application should allow to select files from the filesystem and display an alert with the select file’s name. 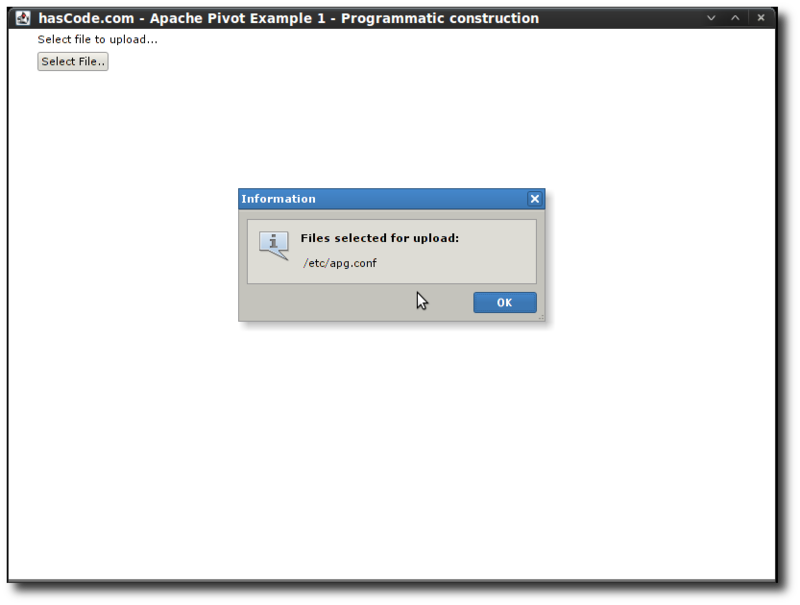 Programmatical example - selecting a file. Now we want to create the same application but using XML/WTKX templates to specify the user interface. 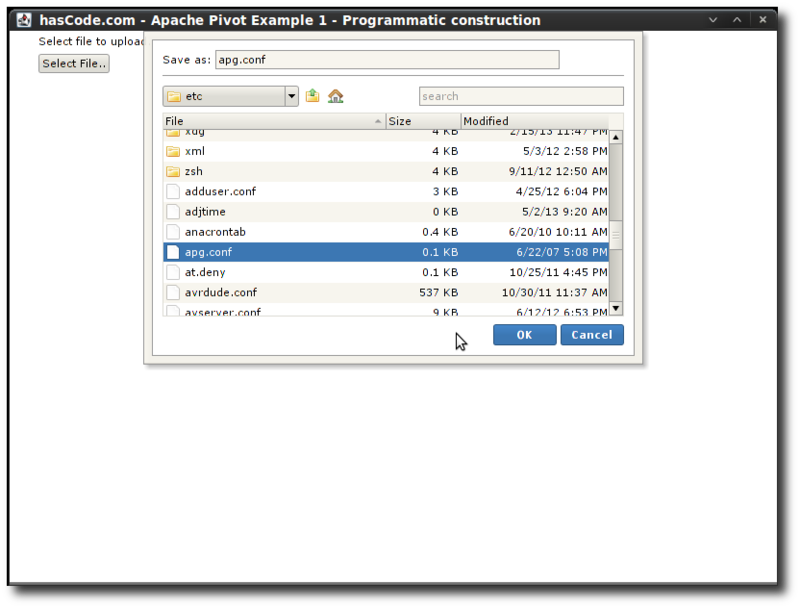 <myApp:Sample2.MyApp title="hasCode.com - Apache Pivot Example 2 - BXML Template" maximized="true"
So what’s special here? First of all, we’re binding the root element to our application class .. as we’re used from other ui binder frameworks in general each attribute for an element refers to a setter in the corresponding java class. This entry was posted on Sunday, May 19th, 2013 at 7:55 pm	and is filed under Development, Java. You can follow any responses to this entry through the RSS 2.0 feed. You can skip to the end and leave a response. Pinging is currently not allowed. One little thing: In the two code snippets you use the name “filemanager.bxml” for the template whereas in the article itself you use the name “filebrowser.bxml”.